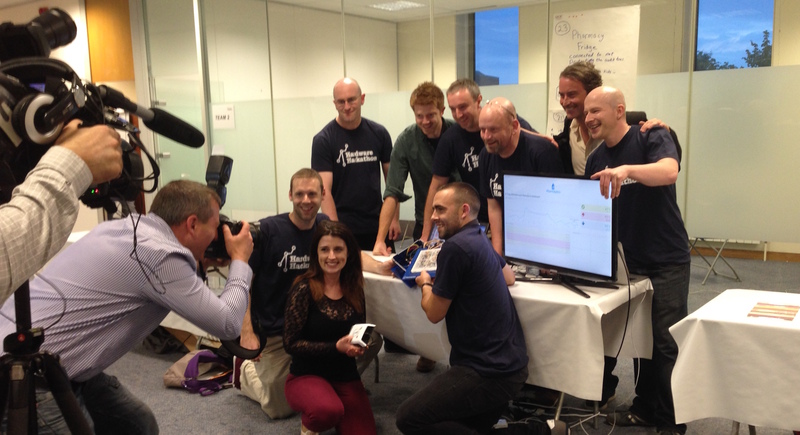 Ireland’s first Hardware Hackathon, which took place in Dublin City University’s Innovation Campus, has been won by Pharmalytics using EpiSensor’s Internet of Things platform. The Pharmalytics team developed a connected fridge for pharmacies that can send an alert if the temperature of stored medication rises above a safe limit. The product also makes it easier for store owners to comply with regulatory requirements, automating the process of recording temperatures for vaccines that require cold storage. We found from speaking to pharmacists that a real problem exists. Keeping paper-based logs of temperature in a fridge where drugs or vaccines are stored can increase overhead, lead to compliance issues, and potentially impact on patient health.” said Tracy Keogh, whose presentation impressed an experienced panel of judges at the Hackathon. The Pharmalytics team prototyped a battery-powered “smart mat” during the Hardware Hackathon, which can log temperature readings even when the power supply to a building fails. The Pharmalytics team utilised EpiSensor’s Internet of Things platform to collect live temperature data from a fridge on the DCU campus, which was sent to the cloud so notifications could be raised if a temperature exceeded a safe limit. Dublin’s Hardware Hackathon is an informal gathering of makers, entrepreneurs, designers, engineers, creators, innovators and developers from across Ireland, who work together for a weekend to turn ideas into prototypes, and pitch to industry experts. EpiSensor is one of the world’s leading suppliers of easy to deploy, secure and reliable wireless sensors. Our Internet of Things platform is trusted by some of the world’s largest and most secure organisations. EpiSensor has lowered costs and reduced environmental impact for Fortune 500 customers in Europe, Australia, Asia, and North America.